← 2nd Annual Installerstore Yard Sale – SAVE BIG! 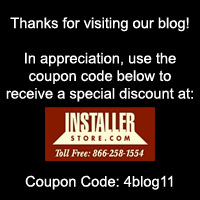 Tile Installation Tools – Everything You Need! Get ALL of the grouting tools you need on Installerstore.com! Tile installation tools such as grout floats, grouting sponges, protective foam knee pads, and a convenient kit with many of the tools listed about to get you started! Tile Installation Tools available on Installerstore.com! This tile installation tool kit has EVERYTHING you need to get started! Extra Large sponge with rounded edges to minimize “digging out” of grout. Add this to your order, and pay no extra standard shipping! This is the perfect tool for tile installation! Easily shape your grout with this Rubber Grout Float. These foam knees pads are an inexpensive step to saving your knees during tile installation. A common after-effect when installing grout is the presence of Grout Haze. We have many products to help remove this from your newly installed tile flooring including Aqua Mix and Blaze. Need to remove existing grout to replace/repair? We have products for this too!! Use this grout saw as your go-to grout remover tool. Affordable, durable AND easy-to-use! Replacement blades for the grout saw removal tool. Each package contains 2 different types of blades for the 1 low price!